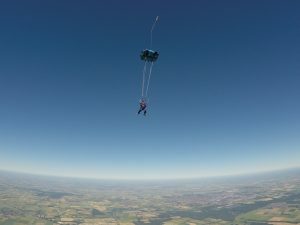 Our very brave trustee and Masto Mum, Dawn Brogden, jumped from 15,000 feet on June 30, 2018 to raise money for The UK Mastocytosis Support Group. Dawn’s son Dylan, age 6, has cutaneous mastocytosis, and the group has been a great help to the whole family. We are so proud of Dawn for her brave jump! She has already raised more than £3300 pounds and is still accepting donations. Help her reach her fundraising goals at BT My Donate. It was a beautiful day in Lincolnshire for the jump. Watching excitedly from the ground were Dylan, husband James, and Dawn’s dad, as well as fellow trustee, Jess Hobart.